In 1948 Rodney Clarke and Mile Oliver, owners of Bugatti specialists Continental Cars, produced a new sports car, the Connaught. The Connaught was a highly successful sports-racer using a lightweight body mounted onto a modified Lea Francis chassis and powered by a 14hp Lea Francis engine. 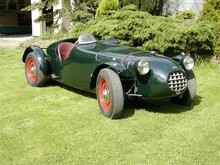 The Connaught cars enjoyed some competition success including a GP win in 1955. Production of road cars was limited to just 14 examples finishing in 1951.